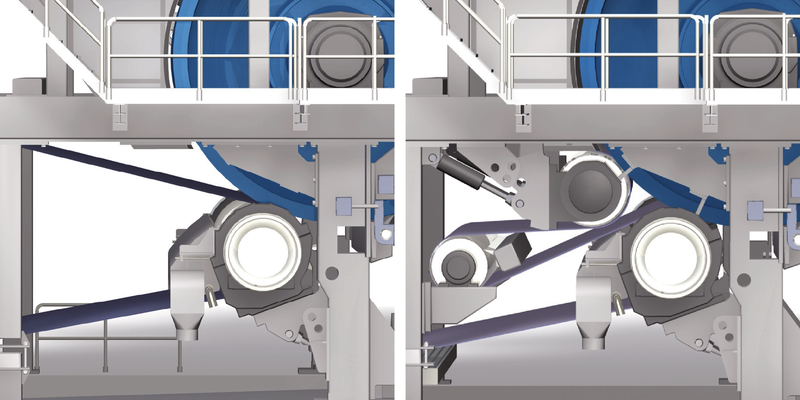 ANDRITZ has created press solutions for tissue machines with one or two press rolls. The single suction press roll is the standard technology for tissue applications. Its role is to assist in mechanical dewatering of the sheet, transfer of the sheet to the Yankee, and maintain good contact between the sheet and the Yankee surface. The suction zones of the press dewater the felt to optimal moisture content before entering the press nip and also dewater the sheet before the nip. In the press nip - typically for roll presses - a symmetrical pressure curve is given, being prone to some rewetting. Rewetting can be minimized by the application of shoe press technology. The ANDRITZ PrimeReel reels for tissue machines are designed for reeling and stable operation for a uniform tissue production. High-end product quality at lower costs. The new ANDRITZ machine PrimeLineTEX enables customers to produce textured tissue of a quality being superior to dry crepe and very close to structured (TAD) tissue, while at the same time achieving significant cost savings.